As I am writing this piece I am listening to Pearl sing "Summer Time" and I am reminded that this a great time of the year to visit your favorite winery. Summer is now upon us, maybe your mind is wondering where should I go on vacation or what should I do for a quick get-away and on the back of mind is your deep abiding love for Pinot Noir, well I would highly recommend the wonderful Willamette Valley in OR. I spent an unforgettable week there a couple of years ago. This is a place for folks who just can't enough of sniffing, swirling, and sipping the fruit of this amazing varietal, which also thrives on this side of the pond in a place called the Willamette Valley. There are a few places which I would strongly recommend going for wine tasting and PG is definitely one of them. 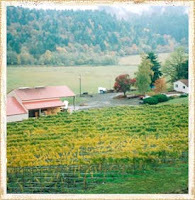 The first place is Patricia Green Cellars, which is in Newberg, OR. If want to go there, you will need to book an appointment, as they don't have a tasting room. When we arrived, we were not even sure where to go, there were no real signs, as we drove up to the property we even wondered if we were at the right place, again no signs. See the pix above I snagged from their website. On the left is the barrell room. Looked like a nice farmhouse, with out lying buildings. I poked my head into what looked like a barn and called out to the name of our contact, we were met my a few dogs and then we met our contact who brought us into the barrel room. It was damn cold in there! Another couple showed up who must have been newlyweds (get a room) but I digress, a wonderful impromptu table of various PN's were lined up, the stemware was ideal and the pour's very generous. One of the highlights was the 2004 Eason in a word, wow! After we came home from our trip, we wanted to purchase another bottle, but alas they were sold out. PG is what you would call a small production winery. So buy all you can carry or afford! If you love Pinot Noir, you gotta go to PG! Can we say Le Midi? "Good wine is somebody's passion"